I believe (with ALL my heart) that low carb eating is sustainable whenever and wherever you are. There are ALWAYS work-arounds and options. Sometimes it takes more planning, but it's still doable to stick to your low carb eating plan during travel and/or vacation. Remember, you're eating this way for your long-term health. Health doesn't take a vacation. Health doesn't get days off. During a recent 10-day trip to Spain, I challenged myself to get through it with no food prep, no coolers and no carrying food with me. Not even a bag of nuts. There was no packing snacks for the airplane or any part of my trip around Spain with my family. This is really unusual for me, as I usually travel with a mid-sized cooler, chock-full of nuts, raw veggies, meat sticks and other pre-made low carb food items to get me through the terrible airplane options and long layovers. I'll show you exactly HOW and why I challenged myself, what I ended up eating, what I cooked at our rental apartments and if I slipped up at all. First, check out my introduction video below- as I'm walking through the Miami airport- on my way to our first stop in Amsterdam. 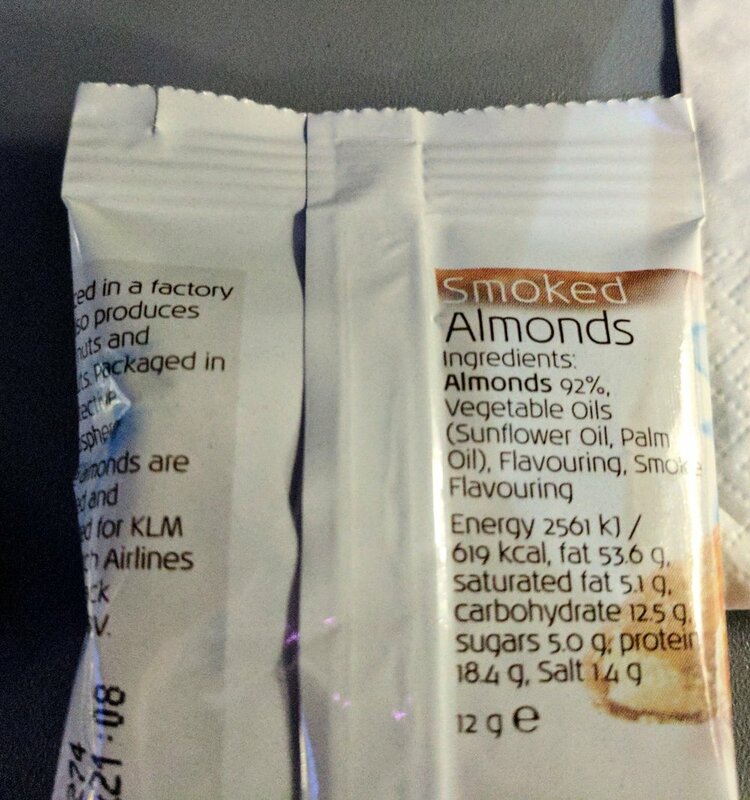 We flew KLM Royal Dutch Airlines to Amsterdam, then connected to Spain after a short layover. It was an evening flight, leaving at 7 PM from Miami. Based on my experience with overnight flights, I knew that dinner is served impossibly late for most of us, at about 10 PM. Because of this, we stopped for dinner in the airport ahead of time and I was able to find a beautiful (albeit insanely expensive) Southwest Chicken Salad. 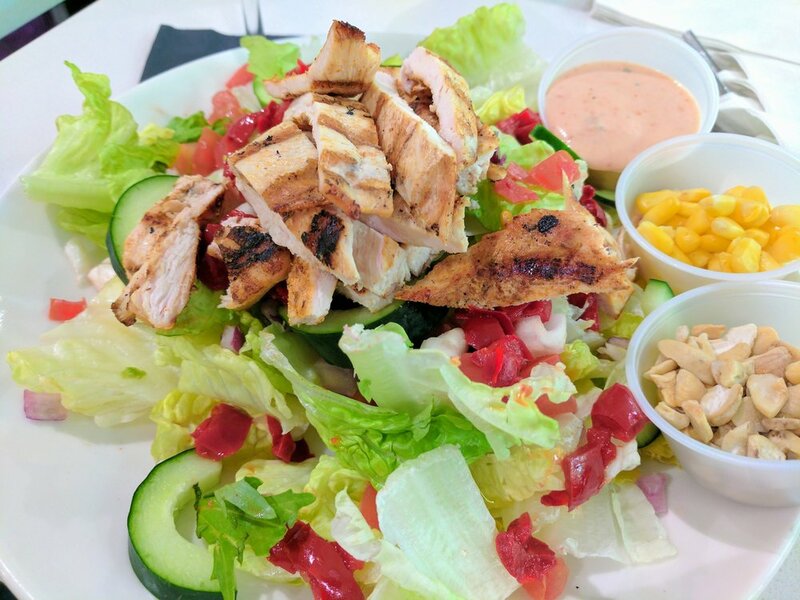 I asked for no cashews and corn, with dressing on the side, but apparently that salad dressing looked a little lonely and they decided to include the trio. Maybe they couldn't justify the price without the extra ingredients? Whatever the reason, the salad (below) was still tasty without the carby extras. Do you want to switch the time on your pump now, when you land, or sometime during the flight? This should match up as closely as possible with your sleep time since most of us have a very different basal rate for sleep vs wake times. It couldn't be that bad, right? It was a tiny serving, about half of a 'normal' serving size for me and didn't taste sweet at all! Well, certainly more carbs and sugar listed than I'd anticipate (and than I normally eat.) Surprisingly this had little effect on my BG readings, so I questioned it's accuracy. It was a good warning, though and I'll be more careful next time. By this time, it was 8 PM from my starting city and past my normal dinner time (although I had already eaten that salad a couple hours earlier. TIP: Order water whenever possible. Natural water or carbonated, it's best to stay hydrated on long flights. Avoid caffeine if you're planning to sleep later. I'm not opposed to wine on occasion but I always order water when offered. When we booked the flight, my husband had the brilliant idea of requesting two vegetarian meals along with two standard meals, to be split between the 4 of us. He doesn't eat meat or poultry and my youngest is showing an aversion to those same foods, so we figured that we could all find a little something that would fit all of our preferences. My kids are non-T1D and eat lower carb, but not as low as I eat. 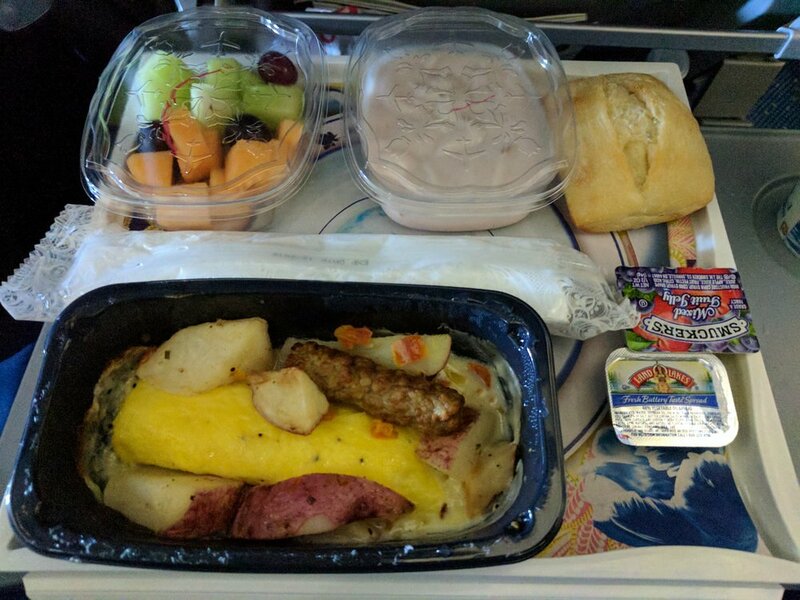 The meals were as expected and I was glad to have the vegetarian meal options, that generally contained fresher/ lower carbs ingredients than the standard airline meal (ie: lower carb salad dressing & fruit vs. high sugar salad dressing & sugar-heavy dessert). I picked out a few things for the dinner but didn't eat much (ie: salads with standard Italian dressing, cheese and a little chicken from the standard dinner). I was a bit frustrated that the vegetarian option was actually vegan and contained no cheese or butter but since I really didn't need this extra dinner (and could have avoided it altogether) we didn't need to eat much. TIP: Be aware that specialty meals are delivered before the main food service so you could be sitting with a vegetarian meal for 20 minutes before your traveling companion(s) get their standard meal. The remainder of the flight went without a hitch - until breakfast time. which was served at about 3 AM Miami time (my departure city). I was anticipating breakfast sandwiches or occasionally we've received scrambled eggs, depending on the airline. This one was more unusual. There was a standard egg/potato/sausage breakfast that had a huge amount of carbs and the vegetarian breakfast only slightly better (Sorry, I didn't manage to get a pic of this one before it was devoured). TIP: Always be cautious of commercially prepared scrambled eggs and omelettes. Many restaurants and food service companies add pancake batter or other flour mixture to add bulk and help eggs stay fluffy. This will raise your blood glucose level much higher & faster than whole eggs. I usually fast in the morning and don't eat until about 11 AM so this wasn't too big of a deal. The larger issue was functioning on the new timezone when I didn't sleep well on the plane. We landed in Amsterdam and I bee-lined it to Starbucks to get a big coffee. Then a short layover with some play time for our daughters and off again to Valencia, Spain. The last fight from Amsterdam to Spain was absolutely ridiculous for food with no low carb options available. The snack boxes contained chocolate bars and cookies. Oh well, I didn't need anything anyway. More hydration for me, then! So- the moral of this part of the story is to eat at the airport or before you leave to the airport- and consider packing food with you. I picked at this food like a bird but considering that the main stretch was overnight, I really didn't NEED to eat anything during that stretch of time. TIP: When traveling internationally, only pack as much as you might eat on the plane. Customs officials may confiscate anything that you have leftover when you land. This is particularly true for nuts, seeds and produce. The next installment will be cover my experiences on the ground in Spain and how our accommodations helped (or hurt) that experience. please check out my recent article for Diabetes Daily. If you want help planning for your life of adventure with diabetes, whether it's a vacation or a life abroad, contact us!